Vanessa has been living in Annville most of her adult life and calls Annville her home. She adores the small close-knit community, but big town feel! 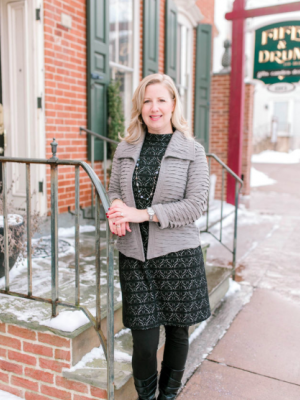 After graduating from Penn State University with a Marketing degree, she settled down in Annville with her husband Tony and began working at Penn State Hershey Medical Center in Marketing and Public Relations. After 8 years in a successful healthcare marketing position, she decided that she wanted to stay home with her children and be a full-time mom. It was during that time that she decided to pursue a life-long interest in Real Estate. She always had a longing for real estate and homes and design. So much that when she was growing up she enjoyed going to open houses to check out the layout of a home. In addition to real estate, Vanessa enjoys traveling with her family, being active together, reading, gardening and spending time by the pool with her two children Dominic and Olivia. Vanessa is also active in the community with her spouse and children. She can be found attending sporting events, helping at school, participating in THON, volunteering with the Friends of the Annville Free Library and much more. Vanessa is excited to work with the Armstrong Team and continue her real estate career. She enjoys working with both buyers and sellers - and would enjoy the opportunity to work with you and to show you her remarkable service.